Derailments and rail collisions are down overall, but WMATA's customer and pedestrian injury rate rose, in part due to an increase in bus crashes. The most common injuries were tied to crashes, stress or assault, lifting or repetitive motions, and slips trips and falls. WASHINGTON — Metro averaged one rail collision and one derailment each month of the year ending June 30, fewer than the same period a year earlier. Seven of 12 collisions in the rail system involved trains, an annual performance report said, while the others involved maintenance vehicles. Six of the 12 total collisions were on mainline tracks where trains carry riders, while the others were in rail yards. The preceding year, Metro recorded 17 rail collisions, which can range from minor bumps to something that causes more significant damage. Metro also recorded fewer derailments in the year ending in June than the previous year. In the 12 months ending in June, Metro again had one derailment of a train carrying riders — on the Red Line on Martin Luther King Jr. Day. Another Metro train that was not carrying riders also derailed in January, the report said. The preceding year, Metro had four of those derailments of trains not carrying riders. Metro again had 11 derailments of maintenance vehicles over the 12-month period. In part due to an increase in bus crashes, the bus rider injury rate rose 20 percent to 2.72 per million trips. Despite the rail rider injury rate falling slightly to 1.38 per million trips and the MetroAccess injury rate dropping back to 2016 levels, the overall customer injury rate rose for the third straight year from 1.97 to 2.06 per million trips. Bus collision rates rose to 62.6 per million miles driven. There were increases in both preventable and non-preventable crashes, but a slight decrease in the number of people walking or biking who were hit by buses. In the rail system, Metro primarily blames rail rider injuries on distraction or drunkenness. On buses, the increase is blamed on the collisions and slips or falls. The employee injury rate also continued to rise. It jumped from 4.9 per 200,000 hours worked in the 2016 budget year, to 5.9 in the 2017 budget year, now to 7.1 in the 2018 budget year that ended June 30. While the rail employee injury rate rose from 3.9 to 4.1 per 100 employees, the bus employee injury rate rose from 7.4 two years ago, to 9.8 last year, and now to 12.3 per 100 employees. The most common injuries were tied to crashes, stress or assault, lifting or repetitive motions, and slips trips and falls. Metro’s serious crime rate continues to fall. How often is Metro on time? 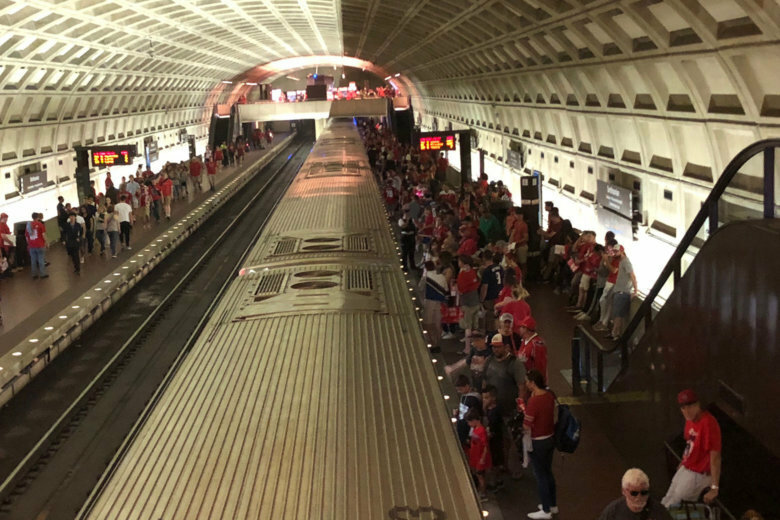 By Metro’s preferred measure, 87 percent of rail riders arrived on time in the year that ended June 30, a significant improvement from the same period a year earlier when there was even more round-the-clock track work. On weekends, though, 68 percent of trips were on time. On weekdays, the on-time total was 89 percent of trips as the transit agency focuses its efforts on rush-hour riders. Between Jan. 26 and June 30, Metro refunded $690,914 to rush-hour riders with registered SmarTrip cards who were delayed 15 minutes or more beyond the maximum expected travel time. On the roads, Metro recorded 78 percent of buses as on time in the year that ended in June. More buses are breaking down though. Metro’s internal surveys found increases in customer satisfaction, even with fewer riders in the system. The customer satisfaction rate rose to 80 percent for rail riders and 79 percent for bus riders this spring, the surveys found.